Sts. 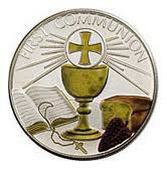 Peter & Paul First Communion is on Sunday, April 28, 2019 at 1:00 p.m.
Holy Cross First Communion is on Sunday, May 5, 2019 at 1:00 p.m.
First Communion Retreat will be held on April 26, 2019 9:00 a.m. to 1 p.m. at St. Joe - Princeton. Please contact Becky Mann, Sacramental Coordinator at bmann@evdio.org or call the parish office at (812) 768-6457. The Holy Eucharist or Holy Communion is a true sacrament, instituted by Christ. Christ is present in the Holy Eucharist. It is therefore to be honored and adored. During the Mass, the bread and wine are transubstantiated into the flesh and blood of Christ so that only the appearance of bread and wine remains. The whole Christ is present and is received by the communicant.